There is a brand new iTunes EP called the All Around Me Holiday Bundle. It includes the tracks All Around Me, All Around Me (Acoustic) as well as Do You Hear What I Hear. If you’ve been looking for a cheap way to buy those three songs, you should check it out. 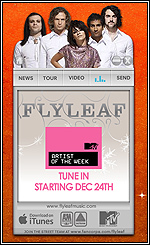 Also on iTunes, Flyleaf is featured as a Best of 2007 Editor’s Choice. You can go here to check out. A bunch more merch has been added to the band’s official webstore. Most of it is older tour stuff that was never available online until now. A new Flyleaf widget for your desktop has been released recently. It’s called the Flyleaf Transmitter and it has cool features like news, tour, music and other stuff too. It’s well designed and handy, so everyone should download it if they’re interested. It comes in both a PC and a Mac version. Yay!!!! thanks for the update. Have a great holiday Brittany! I found this about 3-4 days ago because somebody else found it and posted it on the “Offical Flyleaf Forum” not FlyleafFans. I think it’s a really great song that he did for Lacey. Nice update also, Happy Holidays everyone =). Our own Flyleaf fan site!